3b Scientific is the exclusive FDA cleared imported for several elite-class European therapy lasers. These are the systems that you will see in many of the most advanced books on laser therapy including Dr Weber's book, "A Practical Handbook: Laser Acupuncture". All these products are class 3b systems that offer some unique features that you won't find on any other system. The Laser Shower PowerTwin 21 and 21+ from MKW (Germany) offer up to 2,000mW at 808nm. With the energy spread out over 21 laser diodes, this product offers the largest treatment head of any handheld laser and makes one of the safest high-dosage lasers on the market. With pulsing and continuous output, it also offers unattended therapy. The included accessory comb also makes this one of the best system for treating dogs and horses. The 3b Scientific laser pen is the FDA cleared version of the MKW laser pen built in Germany . Coming in both 200mW and 500mW at 808nm, these acupunture lasers offers all the pulsing frequencies that are popular in Europe like Bahr, Nogier and Chakra. These are some of the most respected acupuncture lasers on the market. 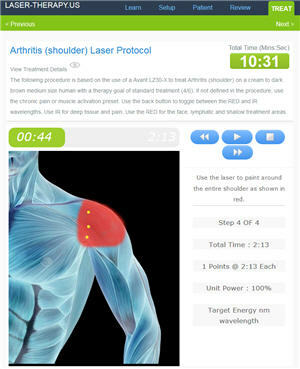 Coldlasers.Org is proud to offer an FDA cleared revolutionary professional-only solution for acupuncturist and practitioners that do trigger point therapy. 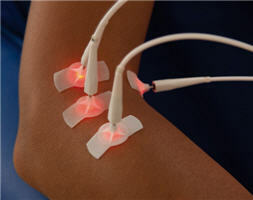 The 3B Scientific laser Therapy system is a unique low-level laser therapy device designed around the use of 12 fiber-optic light sources that can mimic an acupuncture needle without the pain of insertion. The system uses a wirelessly-controlled central light source and touchscreen to setup the set of 12 individual fibers. Each of these strands can send light particles (photons) with high excitation density directly to the needed acupuncture or trigger point. The fibers do not puncture the skin, but are placed on the standard therapy points, radiating with high precision into the tissue. This high-end system allows for much more accurate and potentially higher dosage because it can treat up to 12 acupuncture or trigger points simultaneously and it allow for unattended therapy sessions. 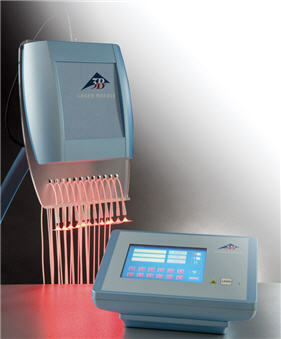 The 3B Laser system can be used simultaneously on any arbitrary point combinations including the body, head region and ear using the classical acupuncture points or trigger points. This provides the same effect as acupuncture treatments in their cerebral and peripheral stimulation effects. Additionally, the laser photons can stimulate complex healing processes in tissues. If you spent much time on this site, you know how much we love "A Practical Guide to Laser Acupuncture" by VolkMar Kreisel and Michael Weber. All the systems shown in the book are 3d Scientific products so they are on the cutting edge when it comes to treating the widest variety of conditions. We include a free copy of the book with every system in addition to the laser-therapy protocol library. This system comes in 2 different versions. With this system the practitioner has total control and feedback of the 3B LASER via the mobile touch screen (Control Touch Pad), which is connected with the laser unit by a radio interface. As a result of this unique technology practitioners have more flexibility. Additionally, you achieve better communication with your patients, who can follow the treatment at all times and thus be more actively involved in the elucidation and therapy. This creates additional trust and increases the therapy success. Using this system the practitioner can spend the treatment time on other issues like patient education while they are getting the optimum dosage. This system is very easy to use so Practitioners can be easily delegated the process to qualified staff members. In addition to a wide range of preset programs and frequencies (Multi, Nogier, Alpha, Bahr, Reininger), individual patient programs can be easily entered, stored under the patientâ? ?s name. This allows practitioners to maintain a database of patient setups. Power (mW), frequencies (Hz), treatment time (min.) and number of laser diodes can stored in the database. Through the color touchscreen, you are always informed of the important functions of the laser, such as treatment time and dosage. The system can be mounted to an existing tables or carts in a few seconds. For small rooms, an optional wall mount allows for the installation of the controller directly to the wall. The system also offers an optional adapter that will convert all 12 fibers into one large treatment head with a total power of 600mW. This allows practitioners to use the system to treat non-acupuncture direct-treatment of damaged tissue. These laser come with installation and training plus general business integration. Each one of the laser needles delivers .05 joules/second. The total time get 8 joules is about 3 minutes. Since this system is delivering that energy to up to 12 points simultaneously, this can be the total treatment or you can go to much higher dosage than are possible with a single-point laser pen. 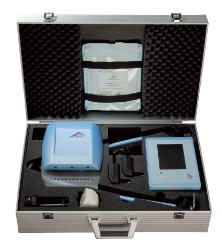 This system comes in a hard case with 2 pairs of glasses and a user's manual. These systems are FDA cleared but does not have Health Canada approval. Ground shipping to anywhere in Canada and the US is free (including Alaska and Hawaii). These systems offer both pulsing and continuous wave output.